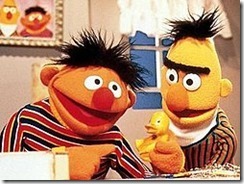 ANSWERS Movies & TV Commentary » Blog Archive » -Bert and Ernie Are Just Friends? Over and over again Sesame Street’s Bert and Ernie have been characterized as a gay couple by different people, magazines, and even other TV shows. Time and time again Sesame Street has officially denied that the two are anything more than friends, and besides that, they are just puppets. The controversy was elevated to an entirely different level last week when, in an interview in a LGBT magazine, Sesame Street writer Mark Saltzman said that he drew from his own personal experiences of being in a gay relationship when he wrote scripts for the puppet duo. "As a writer, you just bring what you know into your work," explained Saltzman. "Somehow, in the uproar, that turned into Bert and Ernie being gay … There is a difference." In a statement posted to Twitter on Wednesday afternoon, Sesame Workshop, the nonprofit behind the long-running children’s television program, explained that the two puppets were not gay, but rather "best friends." "As we have always said, Bert and Ernie are best friends. They were created to teach preschoolers that people can be good friends with those who are very different from themselves…"
"Even though they are identified as male characters and possess many human traits and characteristics … they remain puppets, and do not have a sexual orientation." 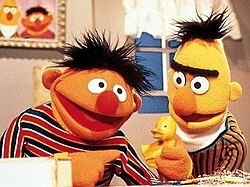 Response: So there you have it, Bert and Ernie are officially just good friends, puppet friends. There has never been anything in the show that would indicate anything different than that but adults have read into their relationship something that was never part of the children’s program.